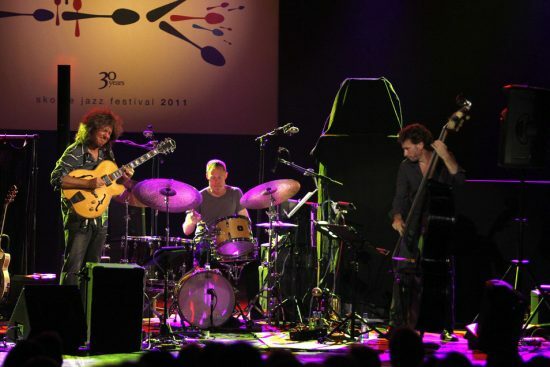 American jazz guitar legend Pat Metheny appeared at Hangar 11 in Tel Aviv, Israel on November 26-27, playing with an all-star trio featuring bassist Larry Grenadier and drummer Bill Stewart. Metheny was interviewed by writer Scott Krane. What prompted you to record What It’s All About, a collection of pop standards? I felt like making a record that addressed some of the specific music that was on my radar before I ever wrote a note of my own, or in a few cases, even before I played an instrument. I kind of wound up choosing tunes that targeted that impulse. I was born in 1954 and all of these songs were songs from the Top 40 during my childhood and early teen years. It was a period when harmony and melody were still important and viable elements in popular music. Every one of these songs has something going on that is just hip on a musical level, no matter how you cut it. These are all pieces that have stuck with me over the years. What was the motivation to record a solo acoustic album? Why now? Playing solo is a relatively new thing for me. People had asked me again and again to do solo concerts. I decided if I ever did do something like that, I would want it to be something very different. The result of that was the Orchestrion project, which I did over the past few years, which was nothing if not different! This is sort of the flip side of that coin, and the fact that the two very different solo projects are right next to each other seems to make sense to me. Who were some of your biggest influences? Well, if we are going to list guitar influences, the biggest one by far is Wes Montgomery. Also, Gary Burton was obviously huge for me in a number of ways. But beyond that, Clifford Brown, Miles Davis and Freddie Hubbard. Somehow trumpet is the reference point for me-it was actually my first instrument. How important is it to you to have an original approach?? To me that is mandated into the jazz form. Until 1980 or so, this was unspoken; you had to come up with your own thing, your own contribution. While there was that strange movement where young guys came along imitating old guys, there was never any significant musical result that came of it. I think jazz is actually quite unforgiving in its disdain for nostalgia. It demands creativity and change at its highest level. What is on your iTunes playlist? Honestly, I am so stuck on “output” that I rarely have time for “input.” But on my playlist you will find a long list of my favorite current and past jazz players, my favorite classical music and a lot of demos and test versions of new pieces that I am working on. Some names as I look over there: Keith Jarrett, Dave Binney, Paul Bley, Art Tatum, Louis Armstrong, Charlie Parker, John Coltrane, Glenn Gould, Leila Josefowicz, Chris Potter, Miguel Zenón, Logan Richardson, and on and on. Is there a secret to your unquenchable inspiration and rigid work ethic? I love playing and working on music. It is something that I feel really lucky to be able to spend my life doing. And I don’t sleep much! What do you do when you are not playing or composing? I have three young kids and a great family. I love hanging out with them more than anything. Can you comment on the bridge between being a musician and being a composer? To me, they go together. What I am looking for in music is a narrative way of going from moment to moment in sound. The quality of storytelling is something that is prominent in all of my favorite players and musicians, from Stravinsky to Wes. The ability to make clear and cohesive statements as an improviser or composer is not unrelated to what it takes to have a conversation, or write an article or do an interview. I am always looking for ways to connect things. Why did you choose to go our on this tour with Larry Grenadier and Bill Stewart?? We have not played together for more than 10 years. What is slightly ironic is that the last time I played in Israel, it was with those same two guys! It is always fun with them-and always different. Do you have any kind of statement about Israeli jazz musicians you may have encountered along the way recently? There a lots of good players coming from all over the place, including Israel. I have been enjoying Gilad Hekselman a lot lately.